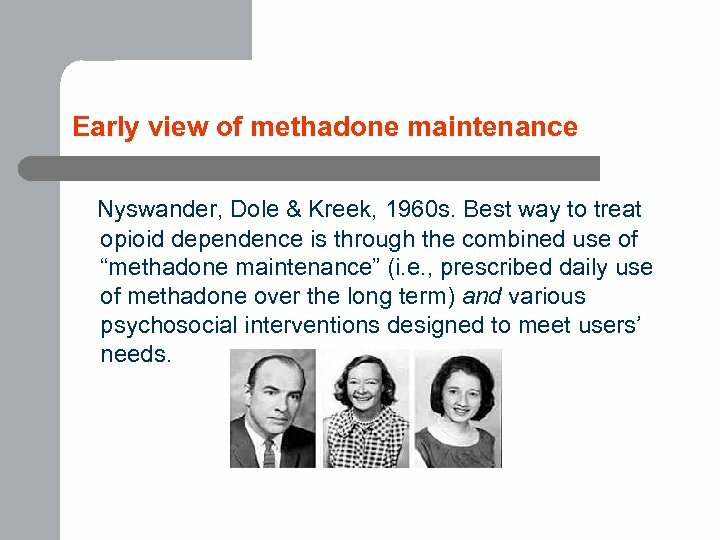 Early view of methadone maintenance Nyswander, Dole & Kreek, 1960 s. Best way to treat opioid dependence is through the combined use of “methadone maintenance” (i. e. , prescribed daily use of methadone over the long term) and various psychosocial interventions designed to meet users’ needs. 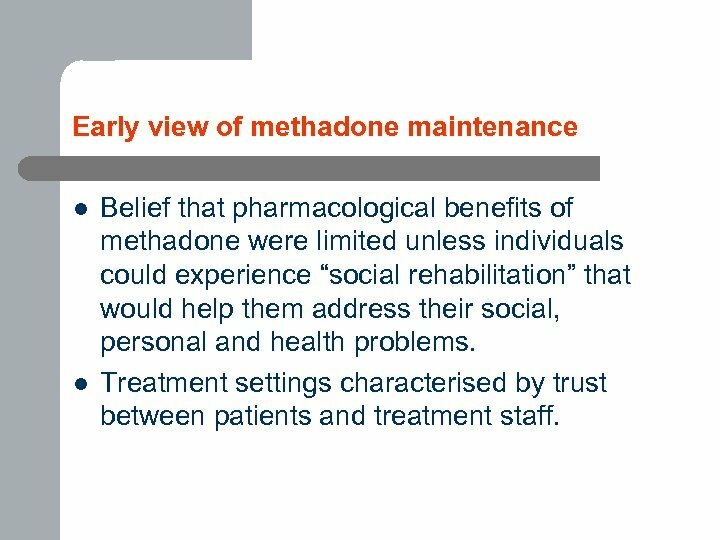 Early view of methadone maintenance l l Belief that pharmacological benefits of methadone were limited unless individuals could experience “social rehabilitation” that would help them address their social, personal and health problems. 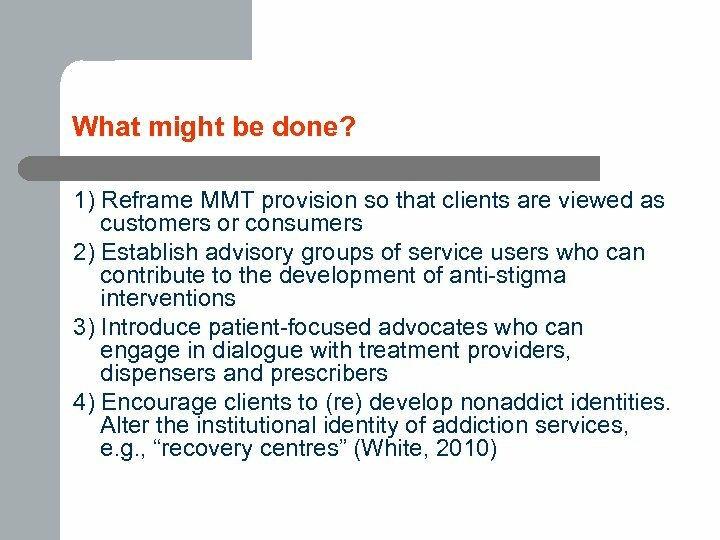 Treatment settings characterised by trust between patients and treatment staff. 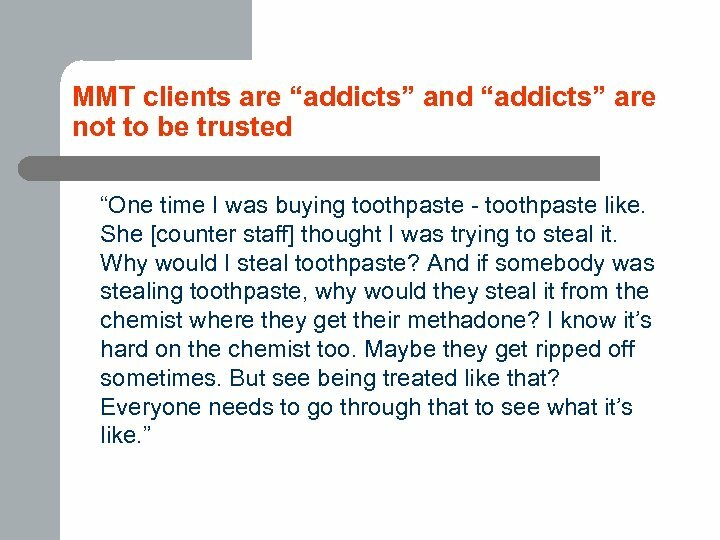 What does the international research tell us about the effectiveness of MMT? 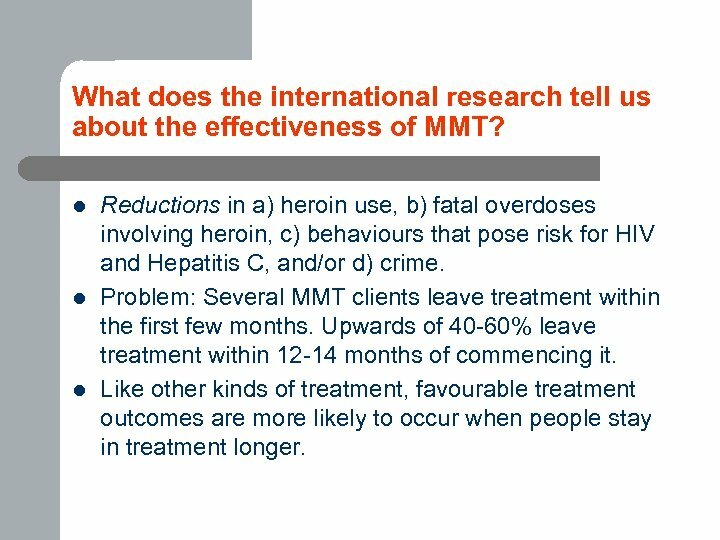 l l l Reductions in a) heroin use, b) fatal overdoses involving heroin, c) behaviours that pose risk for HIV and Hepatitis C, and/or d) crime. 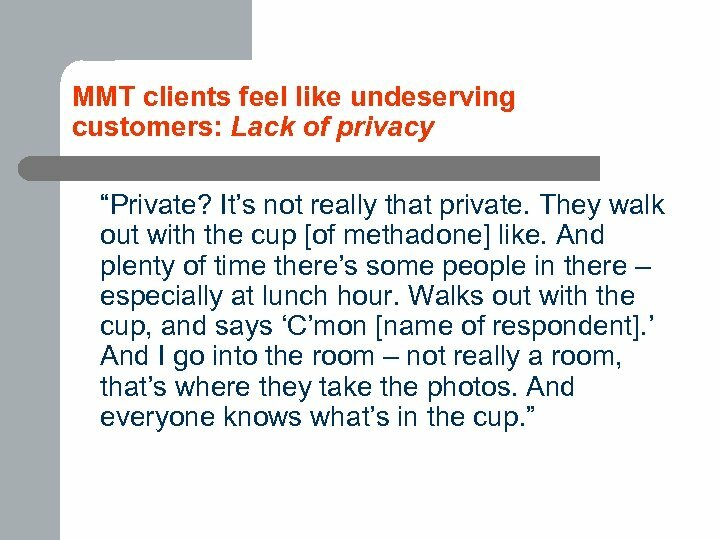 Problem: Several MMT clients leave treatment within the first few months. 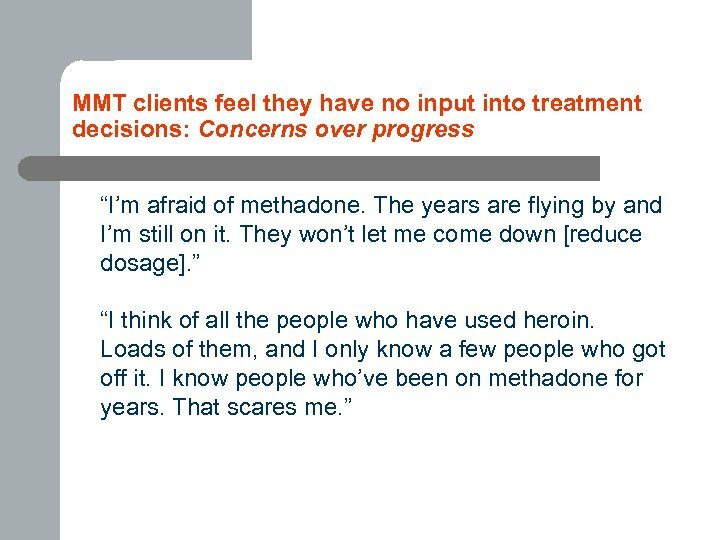 Upwards of 40 -60% leave treatment within 12 -14 months of commencing it. 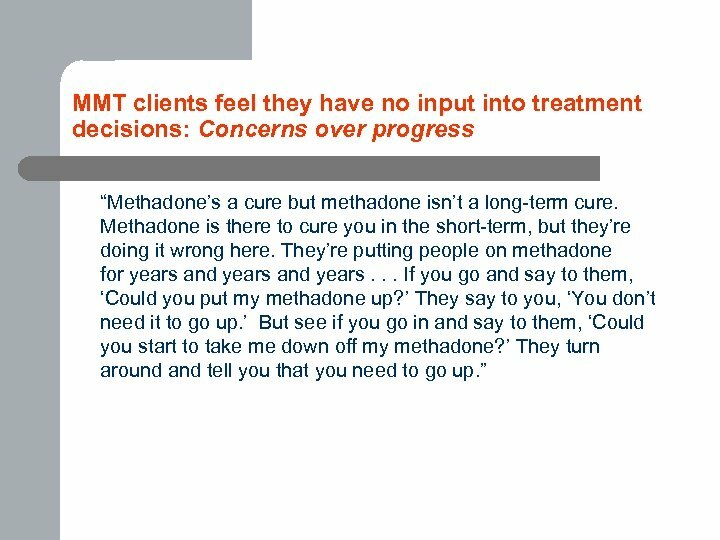 Like other kinds of treatment, favourable treatment outcomes are more likely to occur when people stay in treatment longer. 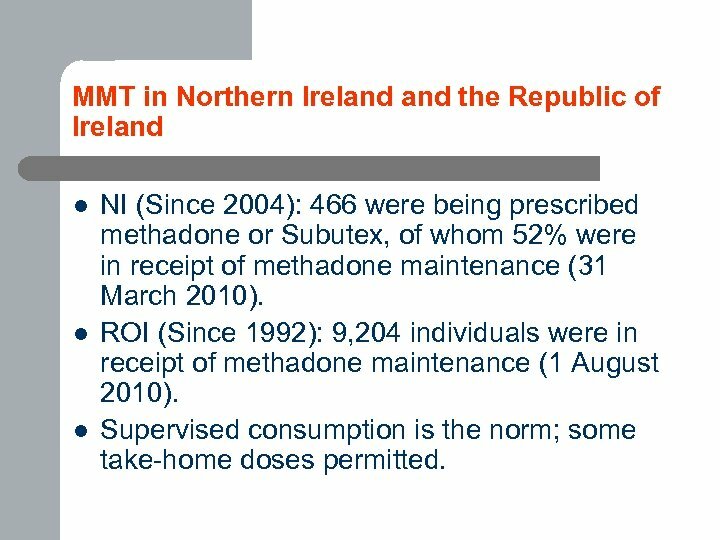 MMT in Northern Ireland the Republic of Ireland l l l NI (Since 2004): 466 were being prescribed methadone or Subutex, of whom 52% were in receipt of methadone maintenance (31 March 2010). 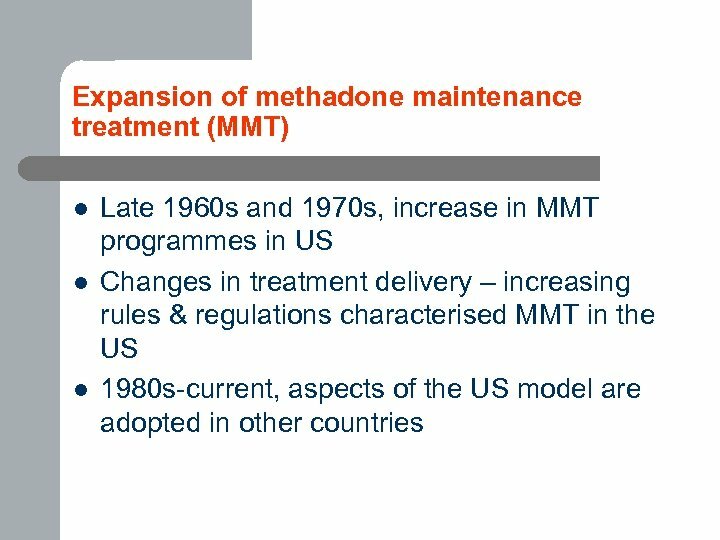 ROI (Since 1992): 9, 204 individuals were in receipt of methadone maintenance (1 August 2010). 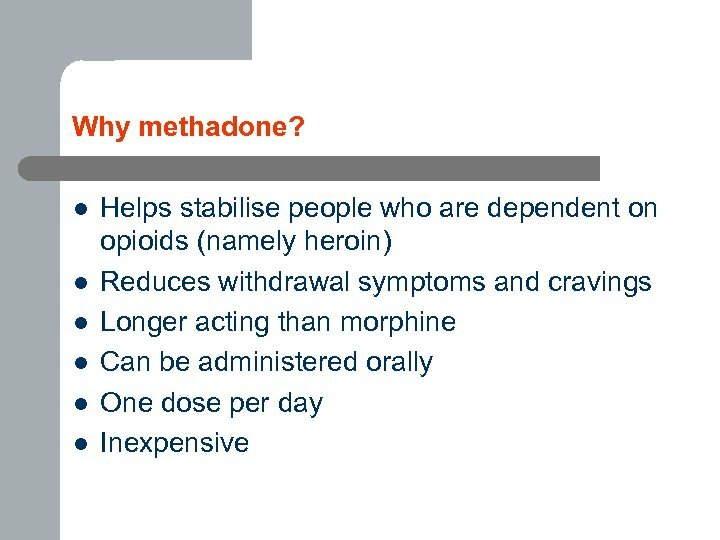 Supervised consumption is the norm; some take-home doses permitted. 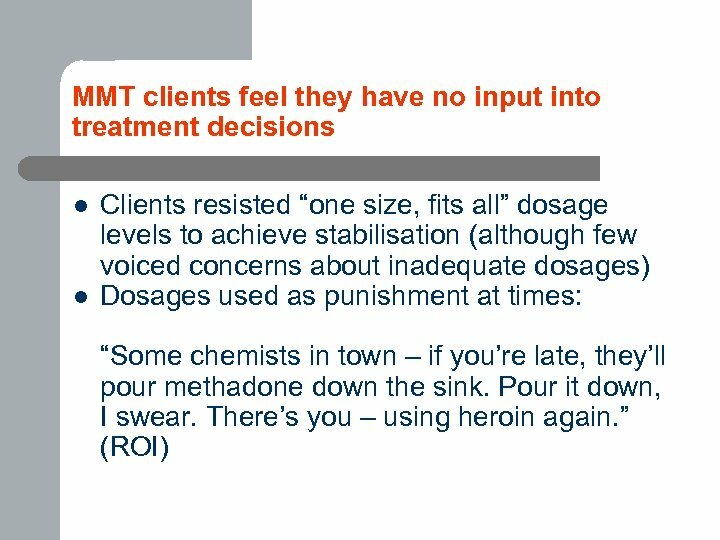 How did we conduct this study? 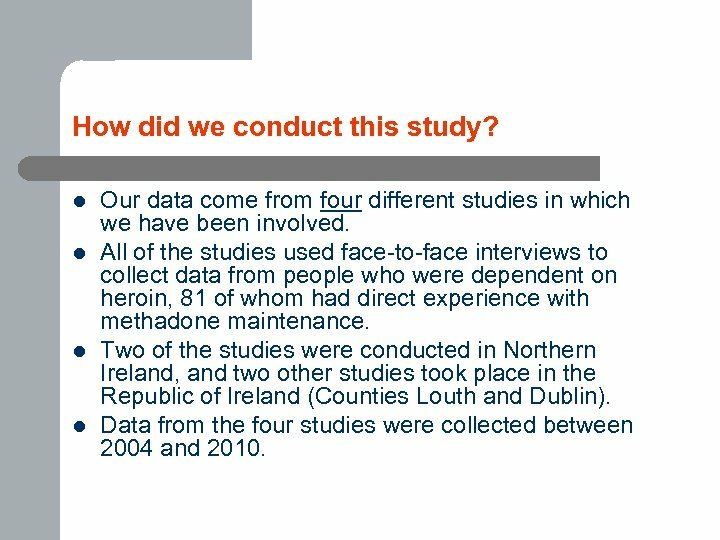 l l Our data come from four different studies in which we have been involved. 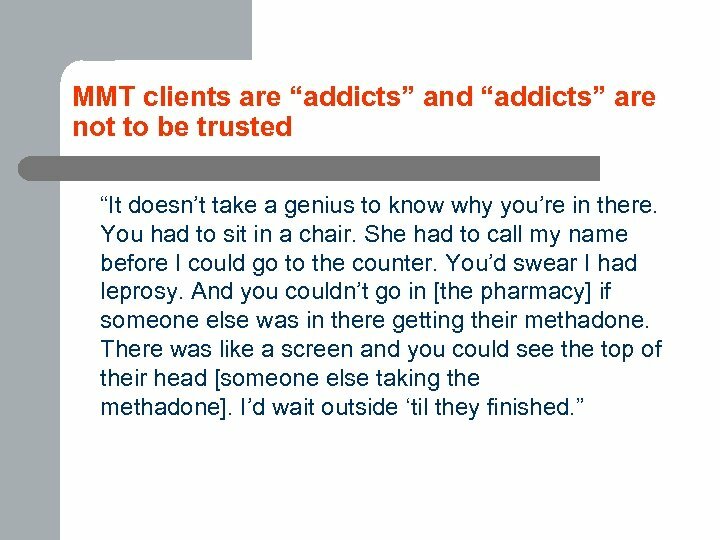 All of the studies used face-to-face interviews to collect data from people who were dependent on heroin, 81 of whom had direct experience with methadone maintenance. 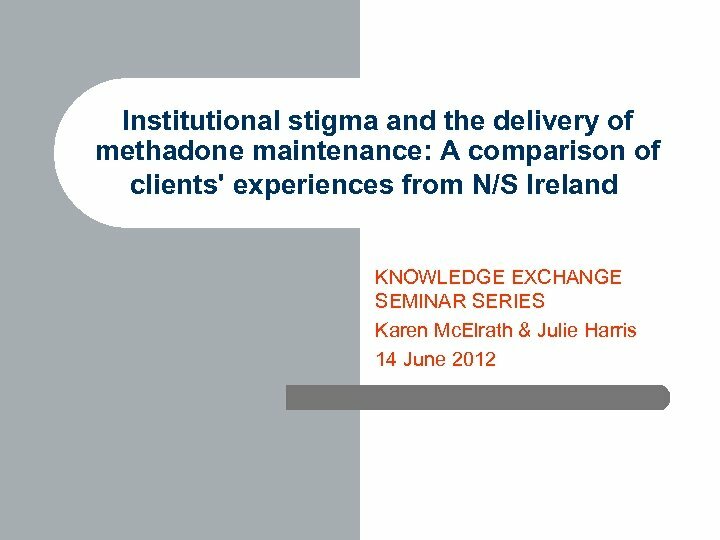 Two of the studies were conducted in Northern Ireland, and two other studies took place in the Republic of Ireland (Counties Louth and Dublin). 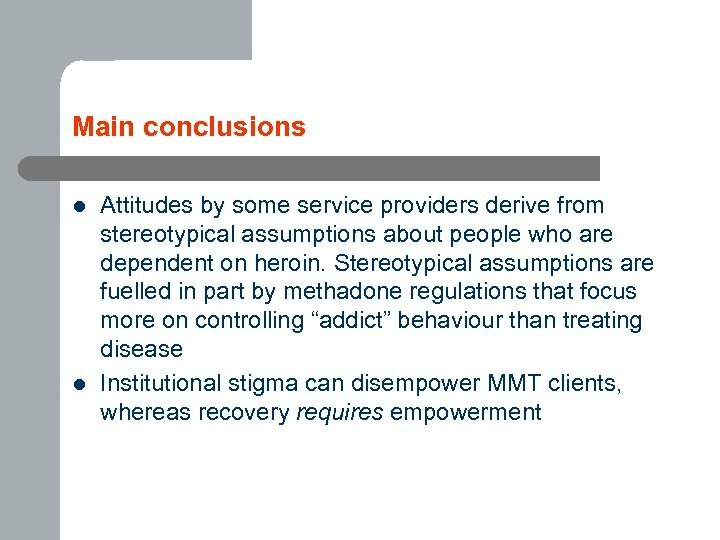 Data from the four studies were collected between 2004 and 2010. 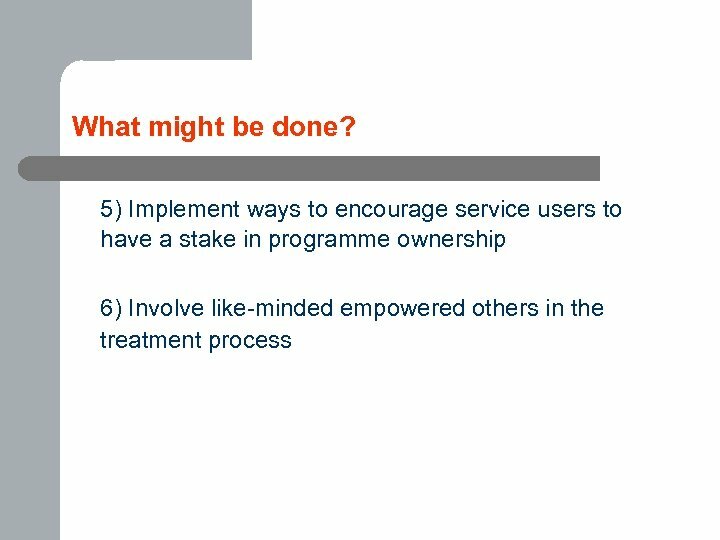 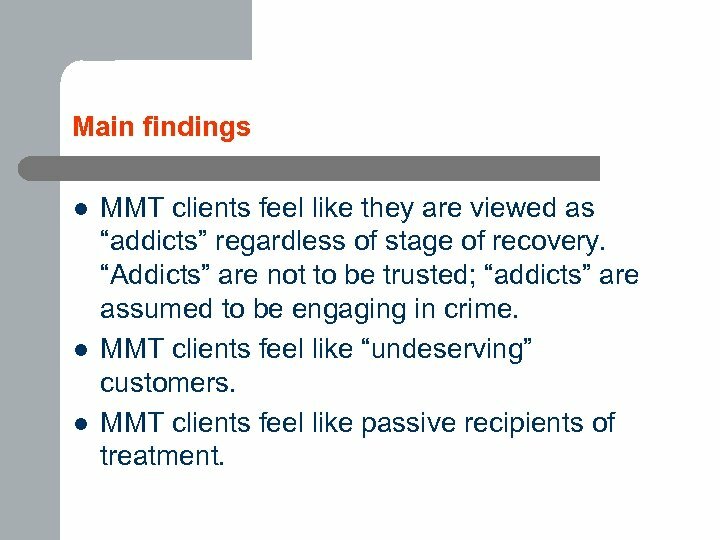 Main findings l l l MMT clients feel like they are viewed as “addicts” regardless of stage of recovery. 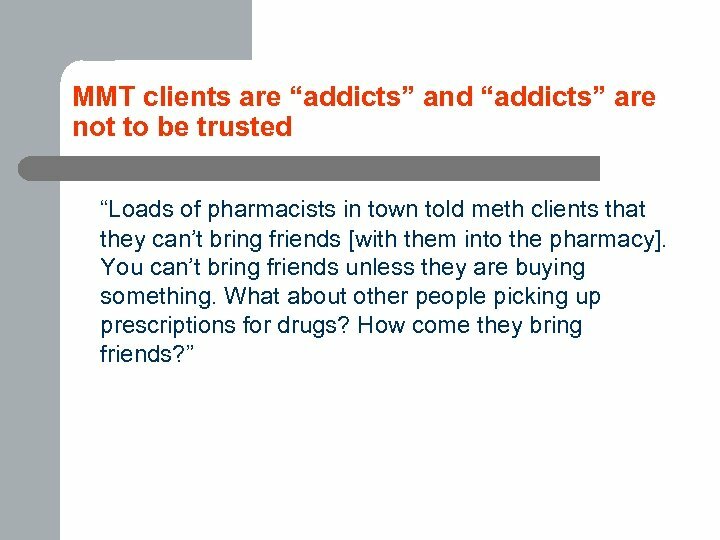 “Addicts” are not to be trusted; “addicts” are assumed to be engaging in crime. 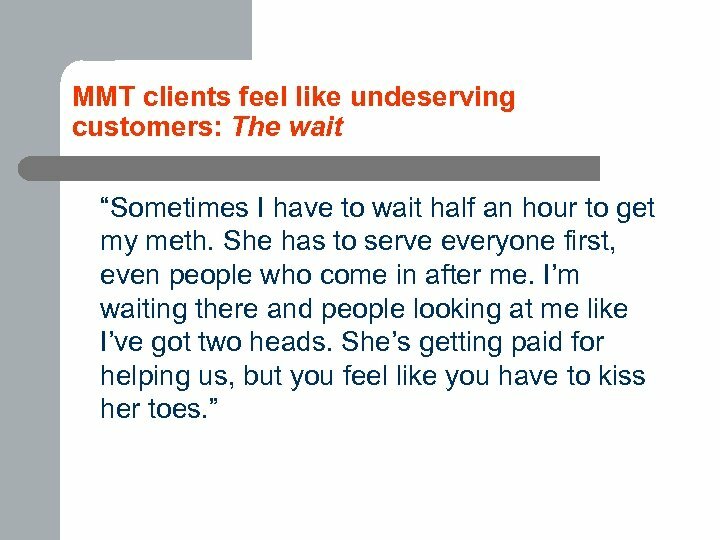 MMT clients feel like “undeserving” customers. 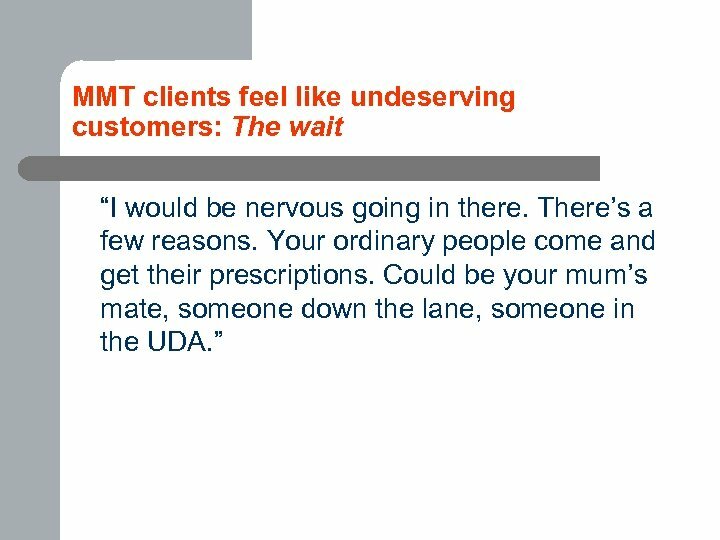 MMT clients feel like passive recipients of treatment. 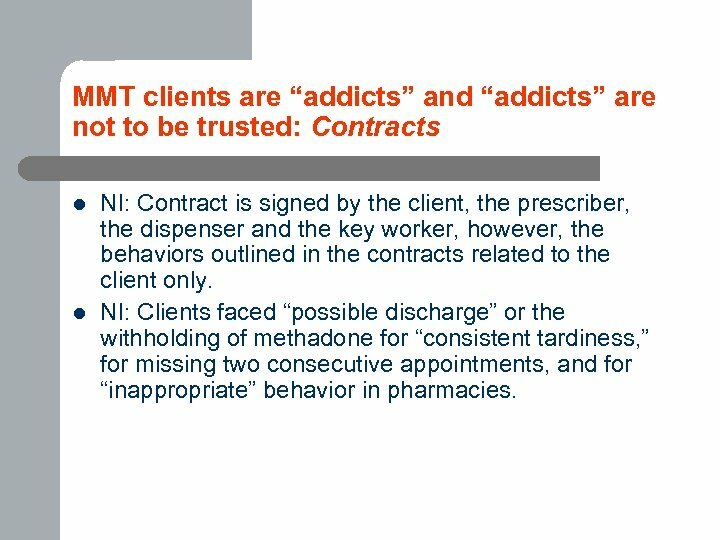 MMT clients are “addicts” and “addicts” are not to be trusted: Contracts l l NI: Contract is signed by the client, the prescriber, the dispenser and the key worker, however, the behaviors outlined in the contracts related to the client only. 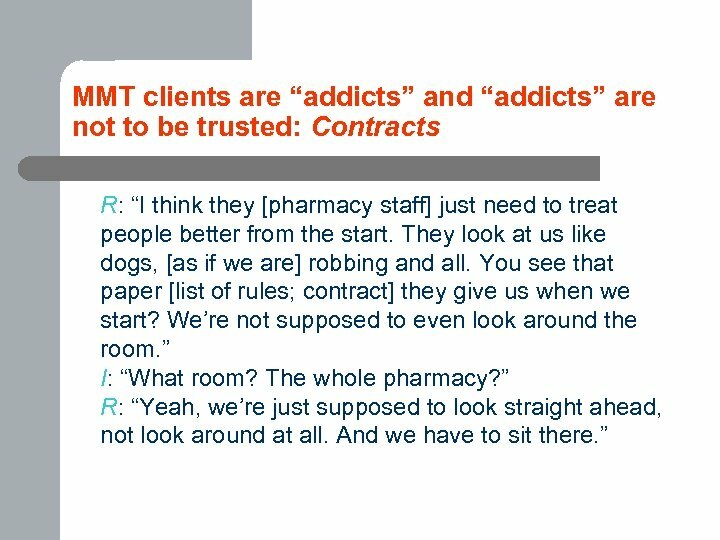 NI: Clients faced “possible discharge” or the withholding of methadone for “consistent tardiness, ” for missing two consecutive appointments, and for “inappropriate” behavior in pharmacies.